Gite-Les-Roches is a beautiful stone farmhouse boasting character and charm, restored to the highest standard offering every modern convenience with all 5 bedrooms ensuite.. Gite-Les-Roches has been designed for outside living, an impressive roof terrace opens from the living room with stunning views over the valley to the village church and down to the pool nestled in natural rocks, a perfect place to enjoy long summer evenings and stunning sunsets. A poolside summer kitchen with BBQ and Sauna complements an equipped farmhouse kitchen. There are 4 bedrooms in the main house all with ensuites, including double ended roll top bath and another with a large walk in shower. 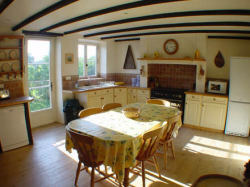 Attached to the farmhouse is 'Petit Roc' a separate studio which is always let with the house. It has a large living bedroom area, kitchenette and ensuite shower room. 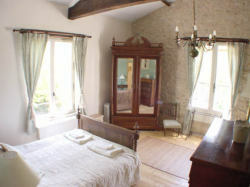 Les Roches is full of exposed beams, stonework and antiques. A 5 minute stroll to the village boulangerie completes idyllic French life. 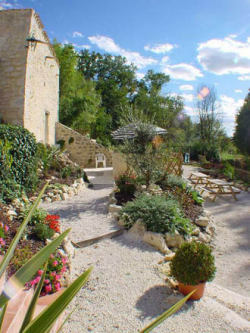 Gite-Les-Roches offers views of wooded valleys and countryside whilst being only a 5 minute walk to the village boulangerie, epicerie and bar. Les Roches is set on the edge of the bastide village of Fonroque. Throughout the summer, the village holds its own fetes and night markets. The picturesque medieval bastide town of Eymet is only a 5 minute drive away with its restaurants, bars, markets (day and night) and shops. The charming Dordogne riverside town of Bergerac is only 15 minutes drive away with its beautiful old town and quay, and airport with low cost flights to the UK. The medieval towns of Issigeac and Duras are just as close. Issigeac market on a Sunday is bustling with local products and is a must to visit. Duras has a stunning chateau which is also well worth a visit. The infamous Chateau Monbazillac is close by with its fairy tale castle, spectacular views and wine tasting. Further a field there is Bordeaux and St Emilion, although still only an hour drive away. All prices are per week Friday to Friday arriving at 4pm departing at 10am. A deposit of 25% is required with the booking. The final balance is due 12 weeks before arrival. A damages deposit of �250 is also required. In low season, the apartment (sleeping 2/3) and the house (sleeping 8/9) may be let separately. We can also accomodate shorter breaks such as long weekends over the low season. These breaks are ideal for golfing, winetasting and fishing weekends. All these activities we can arrange locally. Balance to be paid - 12 weeks prior to th to arrival.